'One at least is saved,' said Gandalf;' for there I got my grey horse, and I name him Greyfax. Not even the Chief of the Nine...' The Council of Elrond (I). given that Tolkien knew he was writing for a primarily non-equestrian audience, doesn't this settle the matter in that The-Horse-Currently-Known-as-Shadowfax was supposed to be grey? I never gave it much thought before, but in my imagination he would have been a light grey rather than brilliant white or dark grey. Otherwise he couldn't shine as described. Silvery grey would do it. According to Carpenter (Tolkien's official biographer) Tolkien enrolled in a calvary regiment King Edward's Horse and subsequently enjoyed the experience of galloping across the Kentish plains for a while. Hammond and Scull note JRRT joining King Edward's Horse in 1911, stating that he learned to ride as a result, if he did not already know. This pleases me. It confirms in my mind that Tolkien knew what he was talking about in all the horse-related passages. He's not the sort of author to write "hoof" when he meant "foot", or "foot" when he meant "hoof". He wouldn't be able to misuse the word grey (noun or adjective) when applied to a horse without understanding that it was an offense against horsemanship. But does Tolkien ever explicitly describe Shadowfax as "Grey"? That's the crux. this is a white horse and its how I imagine Shadowfax, he could shine like silver in the sun, and appear grey at dusk, pass like a ghostly shadow at night. Examples that come to mind at the moment: from The Grey Havens 'a great grey horse' and in Homeward Bound we have 'riding on his tall grey horse' as well as Nomenclature's 'shadow-grey' mane and coat. Interesting. I love Tolkien's gift for choosing words with depth and ambiguity. The word "great" suggests the medieval great horse, a war horse ancestral to the Percheron and others. "Tall" suggests the sorts of chargers we see in monumental sculptures. Petty, I doubt if either of these descriptions would be applied to an Arabian. Grey in this context and coming from a horseman would naturally imply the dark eye and dark skin, and a wide possible color range from white to charcoal. I suspect that's exactly why he adds the modifiers like shadow and shade - to clarify that Shadowfax isn't white. Also probably not uniform but graded in shade. Because he never says "dappled", I suspect that Tolkien was leaving the specific markings open to interpretation, though dappling often resembles the pattern of leaf shadows. For those who like pictures, I rather like this one. I imagine him lighter like the face and neck when in the sun, but blending into the shadows when he passes into the shade, and just look at that color range in the mane! I imagine Shadowfax to be sleeker than that particular horse- but I see your point about the colouring- white it would seem is the least likely colour of Shadowfax! Some sort of greyish, silvery with the hint of deeper shades. 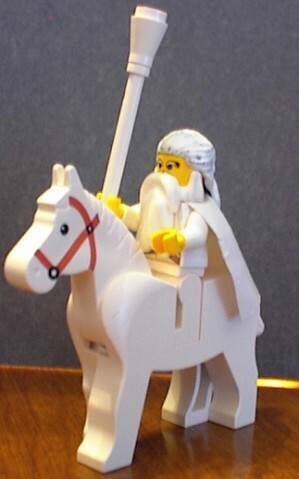 Describing Gandalf on Shadowfax from the walls of Minas Tiith as seen by Pippin 'he caught a flash of white and silver coming from the north, like a small star down on dusky fields. 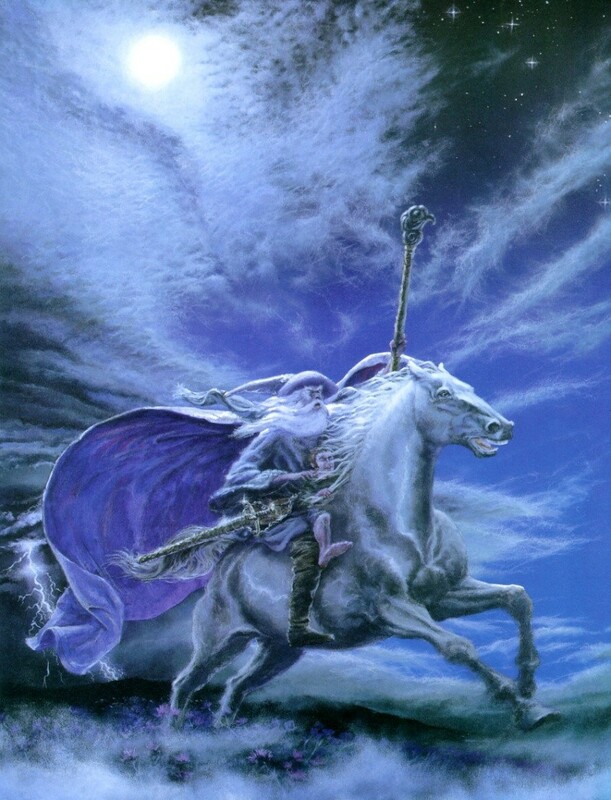 '- the White presumably denoted Gandalf and the silver Shadowfax. Quite hard to find physical descriptions of Shadowfax- harder than I expected! But silver definetly seems to be in the mix. David H wrote: Grey in this context and coming from a horseman would naturally imply the dark eye and dark skin, and a wide possible color range from white to charcoal. I suspect that's exactly why he adds the modifiers like shadow and shade - to clarify that Shadowfax isn't white. While I agree that Shadowfax is not white, I can't agree that because Tolkien rode horses for a fortnight (or longer, but his time with King Edward's Horse was limited in any event) decades before he even began The Lord of the Rings, that his use of grey (not a noun) in his story would naturally imply anything about eyes, skin, and a wide possible colour range from white to charcoal. Or do you mean the horseman is not Tolkien and the context is not his story specifically (as in, a horseman saying the things in the quotes I provided)? If so then never mind. I would agree the word grey seems to be one of Tolkien's favorite words. For examples: Elves (Sindar 'Greys'), garments, eyes, Havens, Company, horses, at least one notable Pilgrim, Thingol. Well I know that over here at that time, a young man would not have received a position in a cavalry regiment unless he was already proficient in the saddle, especially in time of peace when there was no need for cannon fodder. That implies a fair knowledge of horsemanship. I was assuming that Britain took their cavalry regiments equally seriously. Am I wrong? But putting that aside, it doesn't take a lot of horsey knowledge to know what a grey horse looks like, just as you don't need to necessarily be a dog lover to recognize a beagle, or a cat lover to recognize a Siamese. For Tolkien to have not known what a grey horse was in that day and age, he would have had to have lead a very sheltered life indeed. Certainly he could assume that most of his readers would know what a grey horse was. I guess I'm confused. The characteristics I mentioned are common to most if not all horses who are grey coloured at some point in their life, and who are perhaps confusingly called "grey horses" Are you suggesting that Tolkien was wanting readers to think of something other than a "grey horse" as they understood it when they read phrases such as "great grey horse" ? I'm afraid I'd need some proof to believe that. If I'd said that, there's an OzHobbit who would surely have said, "Ruby!" You two have such precious nicknames for each other. Edit: Just noticed that I'm a Wannabe Beard! Who knew I'd become so chatty in here? Guess I try to find a custom title soon... Perhaps I should ask for ideas? Amarië wrote: You two have such precious nicknames for each other. Here to help, just ask! And a very pretty king at that! You're a lad I've come to like, Norc. Anyway, getting back to Shadowfax... Wasn't he a bit ruby hued in certain kinds of light? And 'grey' is another word for 'white' when it comes to horses, isn't it? well I still think Shadofax was white, its more 'legendary' and magical looking, almost like a unicorn, he was the Lord of all horses therefore he should be the most beautiful and a white horse is the most beautiful. Normally in nature I should imagine grey or brown colours are better for camoflage (how do you spell that word?) against enemies and stuff, but Shadofax had no fear, he could outrun the fastest wolf or bigcat I should imagine, so being pure white wouldnt be a handicap. David H wrote: Well I know that over here at that time, a young man would not have received a position in a cavalry regiment unless he was already proficient in the saddle, especially in time of peace when there was no need for cannon fodder. That implies a fair knowledge of horsemanship. I was assuming that Britain took their cavalry regiments equally seriously. Am I wrong? Tolkien certainly loved horses and became a 'breaker-in', and in July and August he spent two weeks with the regiment on the South Coast. According to the brief information otherwise (that I could dig up so far), he was discharged, at his own request. The dates of his service with this regiment might have been postscripted, but officially he was a member for 1 year and 93 days. That said, I have no idea how much time Tolkien spent with horses in this period, or with this regiment (beyond the fortnight noted), but from a general perusal of Hammond and Scull's chronology, Tolkien was engaged in lots of other activities during this period, with school, even vacation if I recall correctly, or military training outside of this regiment, for a few examples. The above citations come from John Garth's 'Tolkien And The Great War', and seem to be reflected by Hammond and Scull. I understand that the first thing breeders do when they look at a "white" horse is look at the skin color underneath. If it's brown, then the horse is usually a grey even if the hair is white. But are you suggesting that Tolkien intended readers to take each use of 'grey' or 'white' specifically as it is used in horse-circles, simply because he was part of King Edward's Horse at one point (again decades before The Lord of the Rings was even begun), or even based on the general idea that he might have known about this even had he never joined the regiment? Again I note that Tolkien never uses the word as a noun in his story (as far as I'm aware at the moment anyway). Or what about Tolkien's use of white for certain horses, grey for others, never calling a white horse simply grey as well (again as far as I know anyway); and I take it that doing so would be proper enough within the horse community. And why employ both white and grey in the same sentence when describing a group of horses? especially if grey can properly be used, as you say, to describe a horse that ranges in colour from white to charcoal? Grey in this context and coming from a horseman would naturally imply the dark eye and dark skin, and a wide possible color range from white to charcoal. And thus you appear to be suggesting that because these external details are true, and that Tolkien knew something about horses, this is what Tolkien expected of his readership; and that to counter the natural implication he added other description to ensure that readers would not think Shadowfax was white. I think the burden of proof is rather on the suggestion that Tolkien intended a meaning of 'white' and 'grey' as it is fairly specially employed within a certain community, over a use of simple colour-words; and one that JRRT seems quite fond of in general. I'm enjoying this discussion, Elthir, and you're bringing much good information on Tolkien to the table. I salute you as Loremaster! You're also making me rethink how much familiarity with horses people today really have. Some simple things that were common knowledge half a century ago clearly have slipped from the common ken. Because the use of grey as a noun seems to confuse the issue for you, I'll try to avoid it in the future. The semantics of this aren't really important to the discussion. Regarding general familiarity with horses, bear in mind that until after World War I people had very little familiarity with automobiles. Horses traveled freely through the streets of all major cities, and cars were expected to yield to them. In farm country, the tractor didn't definitively replace the horse until after World War II. I was born about the time that LotR was first published and the stories I heard from grownups in that time still had a lot of horse lore laced through them. I guess that's why I had taken a certain general familiarity with horses for granted, which was clearly in error, but I think it's equally in error to assume that Tolkien would only have the horse sense of somebody who was born a century after him. To me that seems a very strange assertion, and one that would require some proof. Regarding grey horses, I did a little research, and the colour grey in horses is linked to a specific gene. Greying occurs in about 10% of horses and they all display certain obvious traits, such as the dark eye, dark skin, and continual fading I mentioned. The first horse I ever climbed on was a retired gray mare on the neighboring farm named Blue Lady. During her working life she'd been a beautiful blue-grey color, but when I knew her she was over 20 and had become mostly white with a few dark hairs, especially around her feet, but still the beautiful dark eyes. That's what they all do if they live long enough. She was still a grey horse, but her whiteness implied age, just as white hairs around the muzzle of a dog do. Before I attempt to apply either of these points to the subject at hand, I'd appreciate the Loremaster's comments to make sure we are playing by the same ground rules. I agree David about Tolkiens horse knowledge- there is no reason to assume his experiences in the regiment were the main involvelment of his with horses in his life. When he was growing up they were an everyday sight- I don't drive but I know a suprising amount about cars and engines. Its hard to assess from the current day just how much general terminology relating to horses was common knowledge and in everyday use in Tolkiens youth- but I suspect quite a lot. David H wrote: (...) Because the use of grey as a noun seems to confuse the issue for you, I'll try to avoid it in the future. The semantics of this aren't really important to the discussion. I'm enjoying this discussion too, but I think the distinction between a noun and an adjective is relevant anyway. Outside of historical applications to a grey animal, for instance, the noun would appear to reflect a special use in horse-circles? No? Regarding general familiarity with horses (...) I guess that's why I had taken a certain general familiarity with horses for granted, which was clearly in error, but I think it's equally in error to assume that Tolkien would only have the horse sense of somebody who was born a century after him. To me that seems a very strange assertion, and one that would require some proof. If you mean me, I don't think I've claimed that JRRT would only have the horse sense of someone born a century after him. I had noted (yesterday): 'Actually I expect the employment of 'a grey' in horse circles, or even in literature, to predate Tolkien (partly why I went to the OED), and have no real isssue with the notion that JRRT was aware of this, but writing a story is something different of course.' And if you want to suggest that given the period concerned, plus his military training (relatively brief as it was), that Tolkien would be familiar enough with horses and horse-related terminology, I have no real issue with that as a combined reason, so to speak. My point has never been that Tolkien couldn't know these things, but rather that that alone doesn't mean he employed grey as horse terminology in his books, or intended his story to be read with the adjectives white and grey as doing more than raising a general (but distinct) colour image in the reader's mind. A slight point might be that horses do not seem to be a very consistent part of Tolkien's life (outside of his literary imagination anyway). For instance I have a friend who has made it a point to be around horses all her life. Even she, were she to write a Romance or High Fantasy that included horses, might or might not employ 'grey' as in horse-circles, although I guess it's likely enough that she would (in theory), given a quite notable connection to horses compared to the average person. In any event my challenge has always been to connect this to the examples we find in JRRT's work -- especially published work but other writing as well. Relating 'fact to fiction', let's say. Again, one of Tolkien's favorite adjectives seems to be grey, and I'll refer to the statements I made above with respect to examples of 'white' and 'grey' in his writing.